The Council for the Development of Social Science Research in Africa, CODESRIA, held its 13th General Assembly, 5-9 December 2011, in Rabat Morocco. 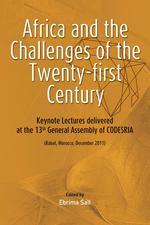 The theme of the scientific conference was: ?Africa and the Challenges of the Twenty-first Century?. Some of the reasons that influenced the choice of this theme were to do with how Africa should position itself in the new global political and economic order in the context of an increasingly complex neoliberal globalisation. Changes in intercultural relations at the global level, climate change, poverty, rapid urbanisation, the ICTs revolution, the emergence of a multi-polar world and the phenomenon of emerging powers of the South are some of the realities of our world that are widely and extensively discussed by both academics and policy-makers. This book contains the statutory lectures of the 13th General Assembly. Each one speaks to major challenges that African and the Global South are facing in this second decade of the Twenty-first Century: neoliberal globalisation, capital flight, the land question, gender relations, with a particular focus on matriarchy; and universalism.